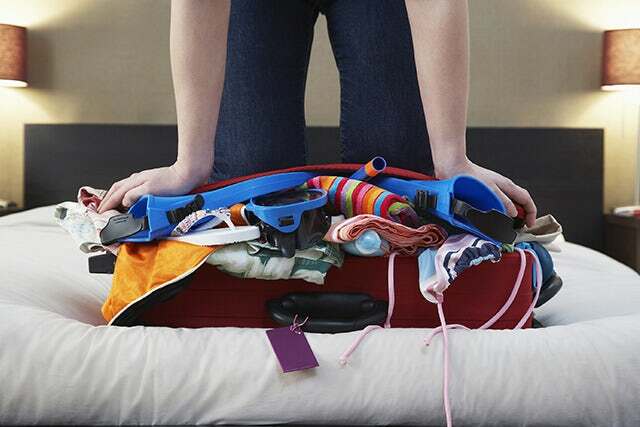 Avoid charges for checked bags on domestic flights with our top packing tips. Both Air Canada and WestJet have recently introduced a $25 fee for a passenger’s first checked bag on domestic flights. This has come as no surprise, but as budget-conscious travellers ourselves, we want to avoid extra charges where possible. According to the Bureau of Transportation Statistics, US airlines earned $3.35 billion dollars in baggage fees last year. The simple answer is to think about whether you really need a checked bag at all. Most travellers can survive with one piece of carry on luggage if they pack smart. Here are our top tips for travelling light, avoiding airline fees and not getting caught out at the check in desk, desperately trying to repack your bag! This may seem obvious, but with so many passengers getting stung for baggage fees, not enough people are making themselves aware of the weight and size restrictions of carry on luggage. Check with your airline ahead of departure and make sure that your bag meets the most up to date regulations. Buy a lighter suitcase to save on weight. That precious weight allowance could be put to better use with things you actually need for your trip! There are many lightweight and durable carry-on bags available that will save you time and money in the long run. Write a list. Especially if you’re a frequent traveller, it pays to have a master list (on paper inside your suitcase or simply on your phone) of all the items you always bring with you. Every time you’re on a trip and realise you forgot something, put it straight on the list so it’s not missing next time. Pack only what's necessary and leave the 'just in case' items at home. Get organised and create a travel kit. Don't be that guy that's forced to check your suitcase because you only had a jumbo-size shampoo bottle. Stock up on travel-size items and keep them all in one place (ideally, in your suitcase). There is a price to pay for vanity! Don't over pack with outfits for every possible occasion. That fourth pair of shoes? You don't need them. The same goes for items such as hairdryers. Plan ahead and call your hotel to see if they have one instead and save yourself the valuable space. There is a bit of a debate about rolling vs. folding clothes, but we think that rolling your clothes saves a lot of space in your carry on bag and helps to prevent creases in your clothes. Use packing cubes or ziplock bags to keep everything organised and you're laughing. Wear It. The simple and effective solution to packing bulky items is to wear them onto the plane - you can always take them off once you're in the air. Don't make the mistake of trying to pack your winter coat and heavy boots in your carry-on!